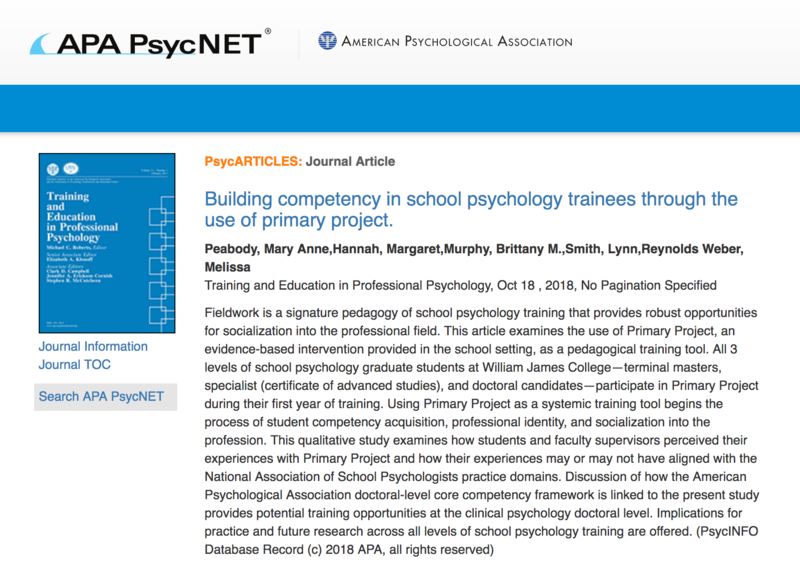 Primary Project Co-Director Lynn Smith, LMSW, recently authored an article titled, "Building Competency in School Psychology Trainees Through the Use of Primary Project" in Training and Education in Professional Psychology. This article highlights a qualitative study and examines how students and faculty supervisors perceived their experiences with Primary Project and how their experiences may or may not have aligned with the National Association of School Psychologists practice domains. Implications for practice and future research across all levels of school psychology training are offered. 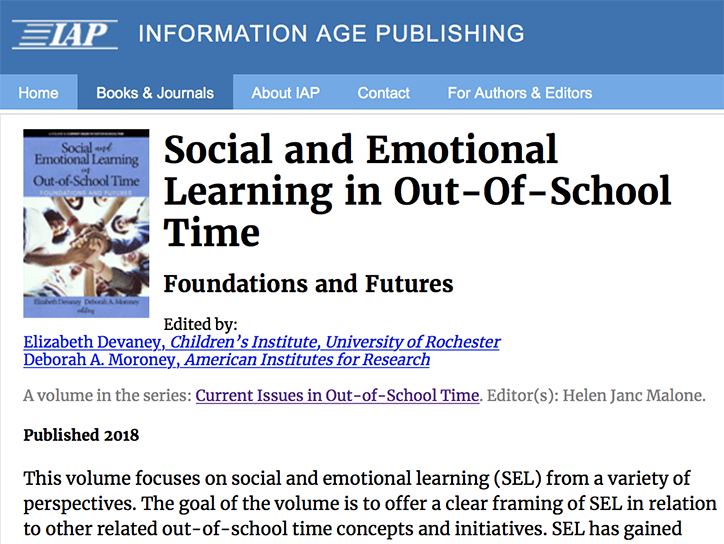 Devaney, E. & Moroney, D.
SEL Center Director Elizabeth Devaney co-edited this recently released volume, Social and Emotional Learning in Out-of-School Time: Foundations and Futures. The Information Age Publishing book is designed to offer a clear framing of SEL in relation to other related out-of-school time concepts and initiatives. SEL has gained popularity as a concept in recent years and there remains confusion as well as great interest in the meaning and implementation of SEL in OST. Policymakers, researchers, and practitioners are pursuing work related to SEL in OST and this volume offers an opportunity to share that work by: Defining and explaining SEL in a variety of out of school contexts; framing social and emotional learning through the lens of high quality youth development practice; sharing information about current trends and new developments; making research to practice connections; and offering recommendations for researchers, practitioners, and policymakers related to SEL in OST settings. Read the book front matter: Table of contents; Foreword by Roger Weissberg and Joe Mahoney; Chapter 1 by Elizabeth Devany and Deborah Moroney. Peabody, M.A., Perryman, K.L., Hannah, M., Smith, L., Sanyshyn, S.M. 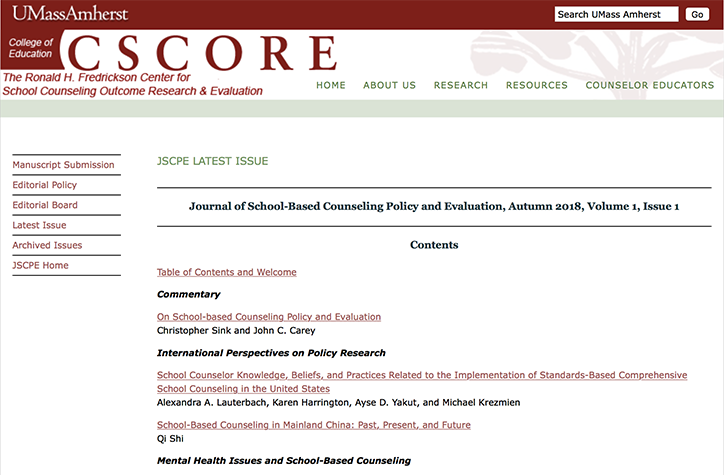 Primary Project Co-Directors Lynn Smith, LMSW, and Shelley M. Sanyshyn, MS, recently authored an article titled, "Improving mental health outcomes for young children through the implementation of the Primary Project" in the Journal of School-Based Counseling Evaluation and Policy. This article describes the history, current state, and future implications of Primary Project. The mental health needs of children are discussed and the role of the school in addressing these needs. Current research efforts are presented with a specific focus on University-community studies in Arkansas and Massachusetts. Implications for future research and school-based counseling and policy and evaluation are addressed. 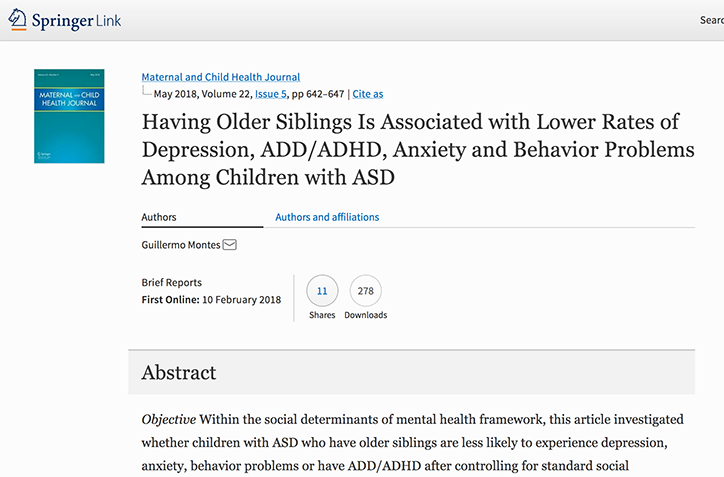 Research and Evaluation Director Guillermo Montes, Ph.D., recently authored an article titled, "Having older siblings Is associated with lower rates of depression, ADD/ADHD, anxiety, and behavior problems among children with ASD" in the Maternal and Child Health Journal. This article investigates whether children with ASD who have older siblings are less likely to experience depression, anxiety, behavior problems, or have ADD/ADHD after controlling for standard social determinants of mental health such as household income, parental education, and adverse childhood experiences (ACEs). SEL Center Director Elizabeth Devaney recently authored a chapter titled, "Out-of-school time learning and 21st century skills: Building on the past to shape the future" in the book The Growing Out-of-School Time Field: Past, Present, and Future. 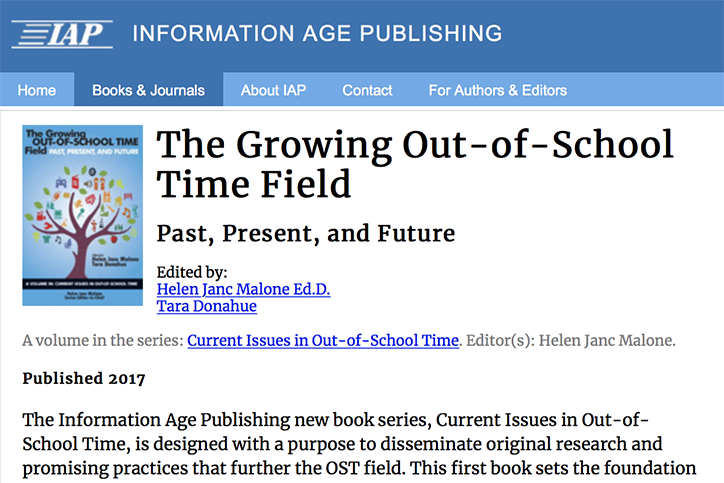 The Information Age Publishing new book series, Current Issues in Out-of-School Time, is designed with a purpose to disseminate original research and promising practices that further the OST field. This first book sets the foundation on which the series rests upon, by offering an analysis of the progress made since the 2000s, as well as by looking toward the future for areas of considerations. Moroney, D. & Devaney, E.
SEL Center Director Elizabeth Devaney authored an articled titled, "Ready to implement? 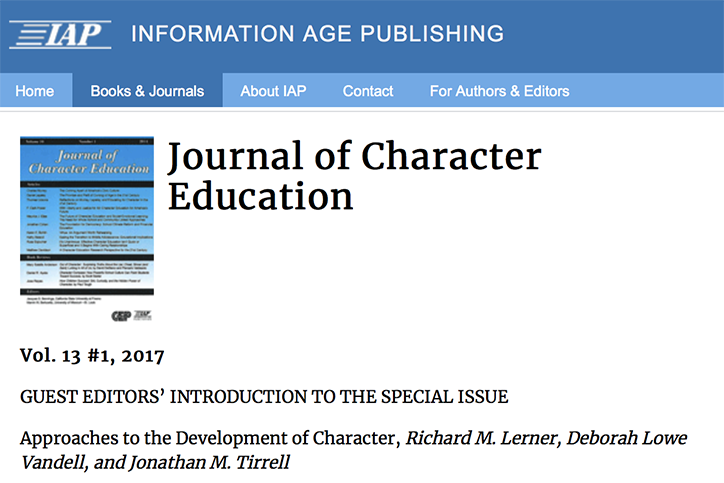 How the out-of-school time workforce can support character development through social and emotional learning: A review of the literature and future directions" in The Journal of Character Education.